1. Stocks reach for new records: Wall Street enthusiasm keeps building after Donald Trump's victory in the U.S. presidential election. The Dow Jones industrial average closed above 19,000 for the first time ever on Tuesday, while the S&P 500 and Nasdaq each hit new record highs. 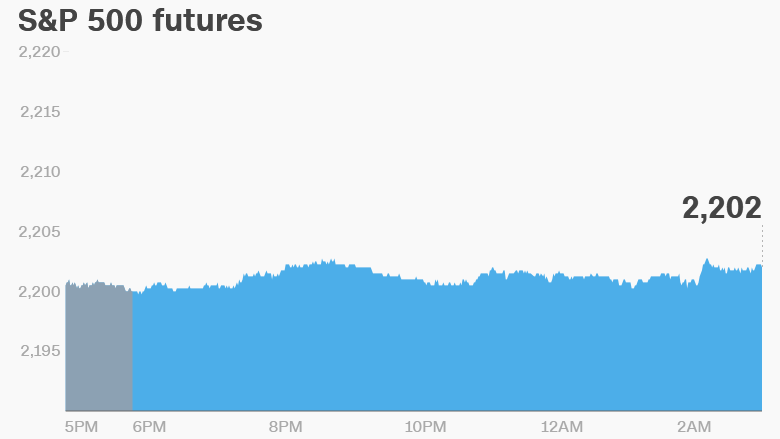 U.S. stock futures still indicate there could be further gains today. The Trump rally has been sparked by hopes that the President-elect will follow through on promises to slash taxes, roll back regulation and rebuild infrastructure. However, some of his campaign promises frighten investors, including talk about tearing up the NAFTA free trade agreement and slapping big tariffs on Chinese products. In Europe, most of the main stock markets posted minor gains in early trading. Asian markets ended the day with mixed results. Japanese markets were closed for a holiday. 2. Fed in focus: Federal Reserve chair Janet Yellen will be the center of attention at 2 p.m. ET when the central bank releases minutes from its October policy-setting meeting. Economists and traders will be looking for more hints that a December interest rate hike is in the cards. Yellen said last week that the Fed could raise interest rates "relatively soon." The Fed last raised its key interest rate in December 2015. 3. U.K. makes a move: The U.K. government's top finance official -- Chancellor Philip Hammond -- is set to make his first major budget announcements following the Brexit referendum in June. Forecasts for the economy and government finances are expected to be downbeat. Hammond is set to outline plans to hike the national minimum wage starting in April. He will also move to prohibit real estate agents from charging excessive upfront fees on renters. Shares in the market-leading real estate agent group Foxtons plunged by as much as 13% on Wednesday. 4. Earnings and economics: Farming machinery manufacturer Deere & Co (DE) is among the key companies reporting earnings before the opening bell. The Census Bureau is releasing data about durable goods orders from October at 8:30 a.m. ET and then publishing data on new home sales from October at 10 a.m.
Crude oil and natural gas inventory data will also be published at 10:30 a.m. and 12 p.m., respectively.